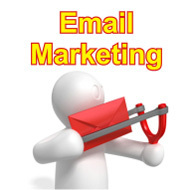 E-mail marketing as the term defines marketing through emails. If you an active marketer - but haven't yet incorporated email marketing into your marketing program the lot of questions are surrounding your business. Today the companies of all sizes and industries are increasingly deploying email marketing as a cost effective means to enhance their brand, strengthen customer relationships and streamline sales and marketing processes. The Goya Communication Solutions has solid knowledge and experience of the current complex business era as well as the deployment of Email Marketing Campaigns. Maximize your business results and return of investments by hiring The Goya Communication Solutions as an Email Marketing Consultant for your business.